The tribal dances are part and parcel of eastern India. That part of the country provides an evolutionary trend of dance styles, most which were started copying nature. People here perform war dances and they have also developed some sacred dances from their experience of spirits and superstitions. Such dances are performed to please the spirits. The tribal dances of Manipuri Nagas are famous. The Chau dance of Orissa, Dhalkai dance from the Sambalpur district of Orissa, Bihu dance of Assam, Britta and Kali Nach of Bengal, Naga dance of Nagaland, Hajagiri dance (harvest dance) of Tripura and the Bamboo dance of Mizoram are some of the popular dances of eastern India. Chhau: This dance from Bihar and Orissa is usually performed by men. A dance known for spontaneity and vitality, it is a popular Indian folk dance. It gets its name after the masks the dancers wear which are known as chhaus. The concept of masks is an integral part of this dance, which owes its origins to an ancient form of exercise known as pharikhanda. This dance also pays special attention to the sets, and the stage is brightly lit with lanterns, torches and oil lamps. The dancers perform solo, in a duet or a group. The dance is usually performed in April, usually for a month. Dhalkai: This lively dance, also from Orissa, is performed by tribal women from Sambalpur. It is performed during festivals. The musical accompaniment is provided by instrumentalists who are usually male. The drummers among these instrumentalists often join in the dance. Brita Dance and Kali Nach: This comes from West Bengal – the state famous for its poets and scholars. Brita dance is usually performed after a recovery from a crisis, such as a life-threatening disease, as gesture of thanking the Gods. Kali Nach is a dance dedicated to the Goddess Kali. The dancer wears a mask and dances while waving a sword. Naga dances: The Naga tribes from the state of Nagaland have a number of different dances which are usually performed during the harvest period. Their dances, full of fun and frolic, are performed when the people are celebrating a particular event. Each of the Naga tribes has their dances, but shares a basic feature. All Naga dances involve a major use of the legs while maintaining the body in an erect posture. Some of the most fascinating dances of this region are the martial art dances, which are performed by young men using swords and shields. The drum dances of Manipur also are worth a special mention. There are a number of drum dances, which mark different festivals. Most of these take place in the spring, an example of which is Dhol Cholom. Manipur dances extend beyond the usual harvest or ritual dances and cover aspects of day-to-day living as well as the natural world. The state boasts several dances and dance dramas. Many of the dances are based on Buddhist stories and legends. The performers make their own masks. Their dances are usually performed in monasteries during festivals. Cheraw Dance: Also known as the Bamboo dance, it is one of the most impressive and spell-bounding dances of Mizoram. Long bamboos are used in this dance. The dancer moves by stepping alternatively in and out from between and across a pair of horizontal bamboos, held against the ground by people sitting face to face at either side. They tap the bamboos, open and close in rhythmic beats. The bamboos placed horizontally, are supported by two bases, one at each end. The bamboos, when clapped, produce a sharp sound which forms the rhythm of the dance. It indicates the timing of the dance as well. The dancer steps in and out to the beats of the bamboos with grace. The patterns and stepping of the dance have many variations. Sometimes the stepping is made in imitation of the movements of birds, or the swaying of trees, and so on. Here are some of the fundamental concepts and terms that form the lexicon of Indian classical music. Raaga – It is a totally unique melodic entity that acts as a tonal framework for compositions and improvisations. A raaga is a particularly specific combination of notes, which form a tuneful scale. This continuum of notes or swaraas and their usage provide distinct characteristics so as to distinguish the identity of each raaga. Typically, a raaga includes many compositions composed in many different genres that are traditional and unconventional. Just one raaga can generate an infinite variety of melodic phrasing and sequencing. For example, we can hear a khyaal, a thumri, a bhajan, a taraana and a film song. all in the same raaga. There are thousands of beautiful raagas that are commonly heard in recordings and live performances today. Taala – All music is set to rhythm, using time measurement. Taala is thus a rhythmic cycle. Each taala has its own fixed number of beats or ‘maatras.’ The rhythmic percussion accompaniment for a classical musician (vocalist or instrumentalist) is provided on instruments such as the tabla and pakhawaj (Indian drums). Few of the most commonly used taalas are Teentaal - 16 beats, Ektaal – 12 beats, Jhaptaal – 10 beats, Daadra – 6 beats, Roopak – 7 beats, Chautaal – 12 beats, Dhamaar – 14 beats, Deepchandi – 14 beats, Addha Teentaal – 16 beats, Punjabi – 16 beats, Kherwa – 8 beats and Bhajan Taal – 8 beats. Laya – It is the tempo or the speed of a taala or a composition. Vilambit Laya refers to slow pace. Madhya Laya means medium speed and Dhruta Laya refers to fast pace. Sapta Swara – These are the seven notes in music. Just like alphabets of any language music is read, comprehended and performed using swaras or notations. The seven notes are universal to all music although nomenclature varies. The seven notes are Sa (Shadj), Re (Rishab), Ga (Gandhar), Ma (Madhyam), Pa (Pancham), Dha (Dhaivat) and Ni (Nishaad). These notes and their variations (sharp and flat) are used in different permutations to form distinct melodies or raagas. Dhun – It is a type of composition typically played by instrumentalists set to light or folk raagas or popular tunes. Dhuns are usually played in raagas Pahaadi, Pilu, Maand, Gaara, etc. Bandish and Cheez – This is a composition that is pre-notated and fixed. It has two parts, namely the chorus and the stanza. The chorus is referred to as the Sthayi or Ashtayi. The verse is the Antara. Alaap – In a performance, the alaap is the introductory part, sung or played without rhythmic accompaniment by way of familiarizing the audience with the raaga about to be explored by the artist. Alaap also sets the mood. The alaap can be swara alaap using notes or swaraas or akar – vocal improvisations using the ‘Aa’ sound or bol alaap using words of the composition. Alankaar – It is a combination of notes belonging to a melody strung together and used as voice exercises or an experiment in vocal agility. Vaadi and Samvaadi – It is the most important note (swara) and the second most vital note of any raaga. Emphasis on these two notes and their interaction give a definite personality to the raaga. For example, in raaga Bhageshri ‘Ma’ is the vaadi swara and ‘Sa’ is the samvaadi swara. Sur – It is the tunefulness or fidelity to the pitch. Saptak – It is the octave or register of scales. Compositions performed in a particular scale typically use parts of three octaves, namely the Mandra saptak (lower octave), the Madhya saptak (middle octave) and the Taara saptak (higher octave). 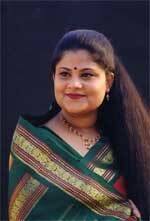 Lavanya Dinesh is an accomplished performer and teacher of Hindustani classical vocal music. She has worked as a music critic and feature writer for The Times of India and Deccan Herald. She can be reached at lavanya@lavanyadinesh.com.